I made these roses for my fiance for Valentine's Day. He never ate them, but displays them at work. They're super easy to make. Roll bacon strip up and place into muffin pan. Repeat with all bacon strips. 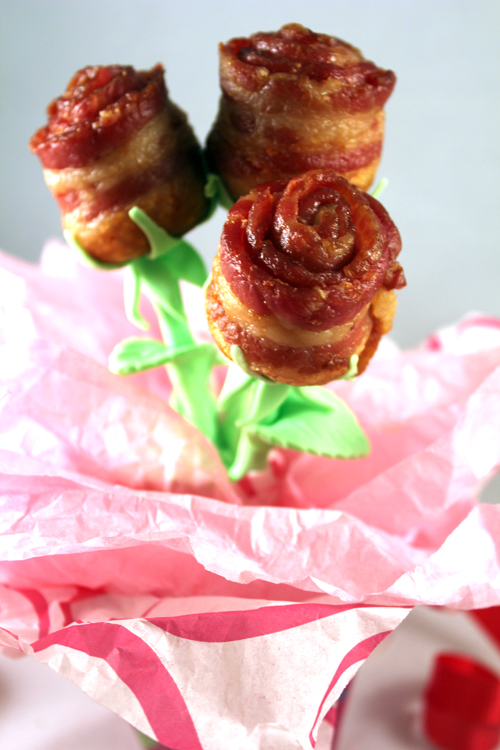 Bake for 10 minutes, then remove each bacon rose onto a paper towel and pour out bacon drippings from pan. Put back the roses into the pan and back into the oven. Repeat the 10 minute cooking time for approximately 40 to 50 mins or until cooked throughly. Cover a skewer with green fondant. Allow to dry. Add leaves. 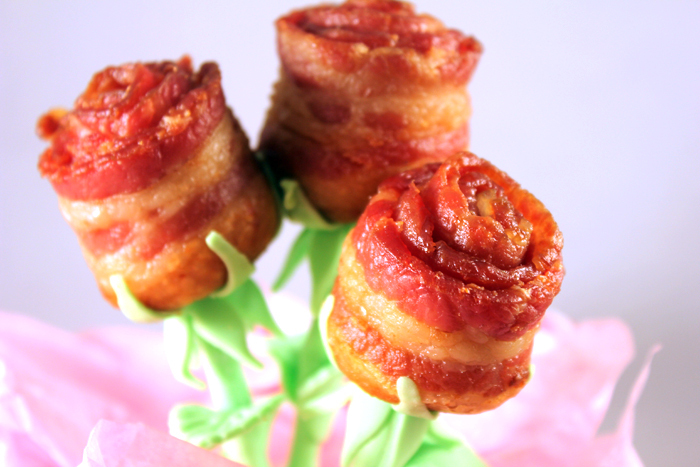 Push sharp end of skewer into cooled bacon roses. Very pretty...Everyone loves bacon! I am trying this out, a post-Valentine's gift perhaps...Thanks for sharing! I wish someone would give me 10 dozen of these!!! LOL... looks sooo yummy! WOw!! Awesome. Rose for Valentine. She will live these. Great recipe. Would you be happy to put up a link to it in my Food on Friday – Bacon Series. Thanks for linking up - I've sorted the link/title thing out for you. Just to let you know that this link to Food on Friday was featured in my Need Some Inspiration? Series today.